Alumni in nonprofit organizations help make a difference in the lives of others. UNT's New College at Frisco, an off-site instructional facility, is a fresh approach to learning. Alumna brought visual effects to the Oscar-nominated Star Wars: The Force Awakens. UNT reaches a top-tier research university designation. UNT advances interdisciplinary research and industry partnerships. Alumni share memories of campus. Accounting alumni use skills in accounting firms, Fortune 500 companies and government agencies. How can you add style to your home or office space? Once again, UNT and the world-renowned College of Music were well represented at the Grammys. New moms in Parkland Hospital learn about the importance of reading to their children. Alum is advancing science and microbiology through an unusual petri dish -- the U.S. Congress. UNT alumnus Edward Boyden's research improves brain cells. A love story that has yielded consistent UNT support. 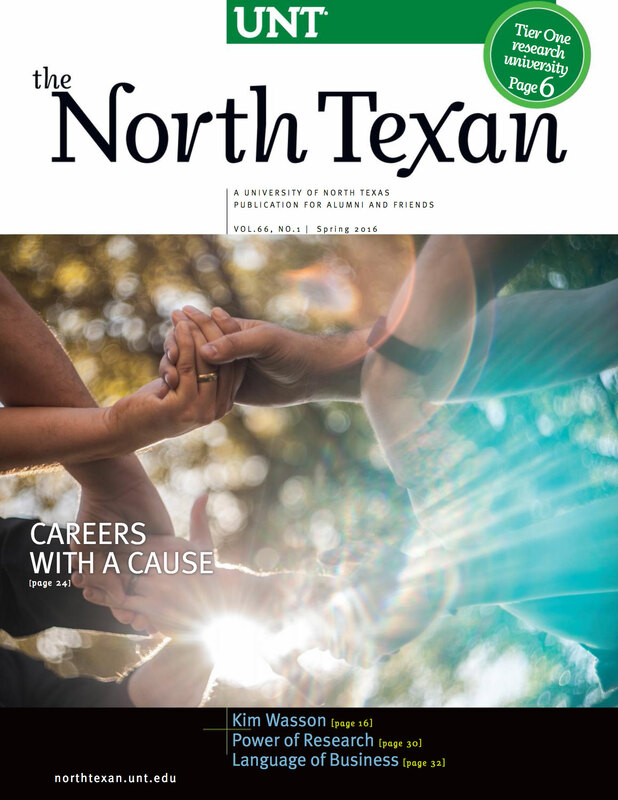 Carnegie Classification lists UNT among Tier One research universities in latest report. New head football coach Seth Littrell signs freshmen and some key transfers. Alum takes photo of the Hurley Administration Building while back on campus. UNT alumna Suela Lee garners awards as part of Zorá String Quartet. UNT faculty member Pamela Padilla takes on leadership role in national STEM organization. Jayme Marrs Castle ('06) may have one of the most important jobs in the theatre. Musician Dariush Rad added president and CEO to his list of titles. UNT students win National Retailing Federation Student Challenge. UNT student Garima Bajwa participates in national three minute thesis contest. UNT student Megan McKay provides comic relief with cartoons depicting college life. UNT alumna Brandi Maxiell courts fame on TV show "Basketball Wives LA". No. 1 graphic design program, alumni create app, "Mean" Joe Greene reminisces about commercial. UNT professor Ian Parberry receives Distinguished Scientist honor from computing association. Faculty recall campus life, teaching and research. UNT alumnus David Hares' photographs of U.S. national parks featured in book, museums. UNT alumnus Azim Rashid works behind the scenes for music's top artists. Distinguished Research Professor of philosophy tackles new environment philosophy. Professor of history and deputy director of UNT's Military History Center has new book. Awards recognize outstanding career achievements, service and support of alumni and friends. Libby Villari has been acting in Texas for 30 years. Now she's ready to take on Hollywood. Chemistry professor and student researchers collect air and water samples in Chile. Clara Bensen turned one unusual date into a book. Miroslav Penkov, associate professor of English wrote the novel Stork Mountain.